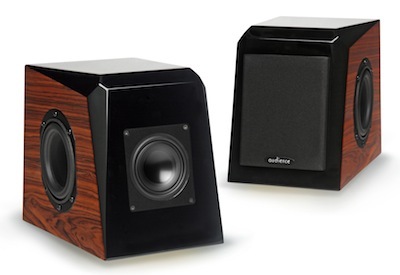 San Marcos, CA, October 28, 2013 – Audience today announced that it is now shipping its ClairAudient 1+1 loudspeaker. The ClairAudient 1+1 is a bi-pole (front- and rear-radiating) design that is compact, yet provides surprisingly expansive sound. Recipient of Greatest Bargain and Best Sound (highest value) accolades at T.H.E. Show: Newport 2012 from The Absolute Sound when presented as a pre-release prototype, the ClairAudient 1+1 utilizes two of Audience’s proprietary A3-S full-range drivers, one in the front and one rear along with two side-firing passive radiators in a crossoverless design, a configuration that yields exceptionally coherent and musically natural performance. The 1+1 is striking in appearance, with a high gloss black multi-angled enclosure accented by rosewood sides. The 1+1 also utilizes Audience’s unique SSIT SweetSpace TM Imaging Technology that provides an expanded listening area rather than the usual single listener sweet spot. The A3-S driver features a large patented neodymium-magnet motor structure and voice coil that moves with a highly linear excursion. It utilizes an exclusive rigid lightweight anodized aluminum-magnesium alloy cone material with a curvilinear shape. The driver’s concave dust cap is made of a proprietary material that is specially designed to control high-frequency cone breakup and provide optimum dispersion. The patent-pending A3-S surround has a unique “S” shape that allows the driver to provide large excursions without impacting the movement of the cone, enabling the driver to behave more like an ideal pistonic (back and forth) radiator. The driver’s patent-pending basket (frame) provides rigid support and eliminates sonically degrading resonances. Other refinements include large pole-piece vents for efficient heat dissipation, a spider (the circular piece that holds the driver’s voice coil in place) that allows unrestricted cone movement and many additional enhancements. The loudspeaker is built using the highest-quality components including the company’s custom-made mono crystal Auric internal wiring. Like all Audience audio components and loudspeakers the ClairAudient 1+1 is designed, engineered and handcrafted in the United States. Posted in audioTagged 1+1, A3s, Audience, ClairAudientBookmark the permalink.